Usually when you see a Swirl dress advertised, it is described as being from the 1950s. 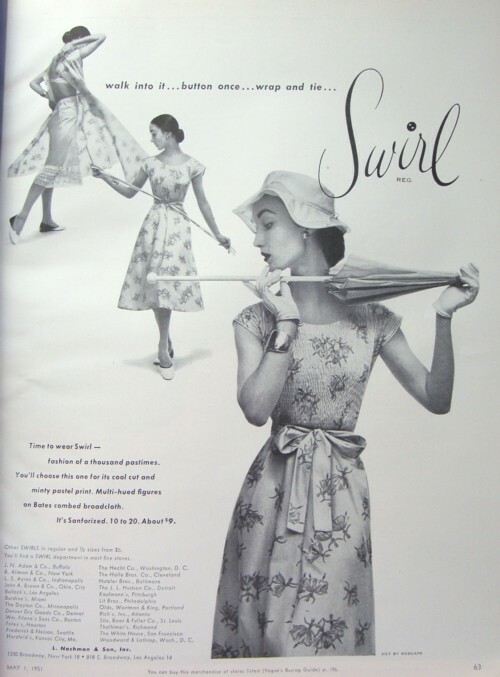 However, the Swirl wrap dress was made starting in 1944, and its manufacture continued at least through the 1960s and possibly even into the 1970s. So how does one date a style that was made practically unchanged for thirty years? This Swirl is probably mid 1960s, judging by the length of the skirt. Today I have another of the articles I wrote several years ago for my website. I hope you enjoy it. The Swirl wrap dress story starts in Philadelphia with the L. Nachman and Son Company, which was located at 10th and Berks Streets. This company had produced clothing since the early days of the 20th century. 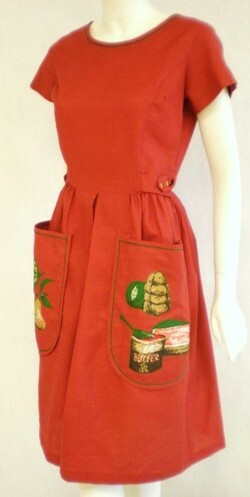 By 1940 they were making a product called the Neat ‘N Tidy, which was a pinafore apron. In 1944 the Swirl dress and label were born. Actually, the Swirl was originally conceived as an apron. When Lawrence Nachman registered the Swirl name with the US Patent and Trade mark office, the product was listed as “WOMEN’S AND GIRLS’ WRAP-AROUND APRONS”. 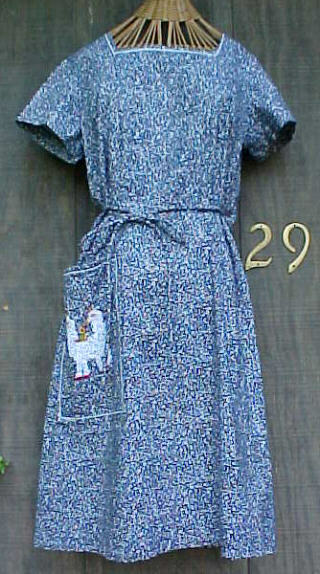 The wrap around apron was a common garment of the day. 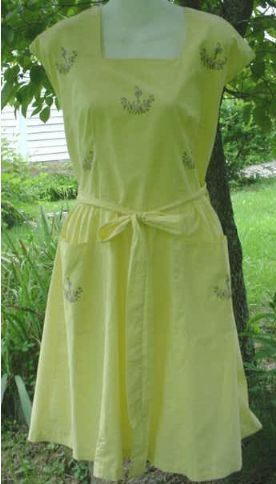 How the concept of an apron evolved into a dress is not known (by me, at any rate!) but at some point, the Swirl became a dress – not really a housedress, but one step above. It was a quick and easy way for a busy housewife to get dressed in a hurry for a trip to the market, or for a casual supper on the patio. As their slogan at the time put it, Swirl was…”YOUR WRAP “N” TIE FASHION”. 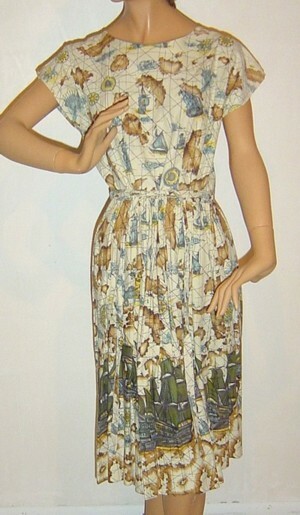 This 1940s Swirl is in the vintage-voyager.com collection. 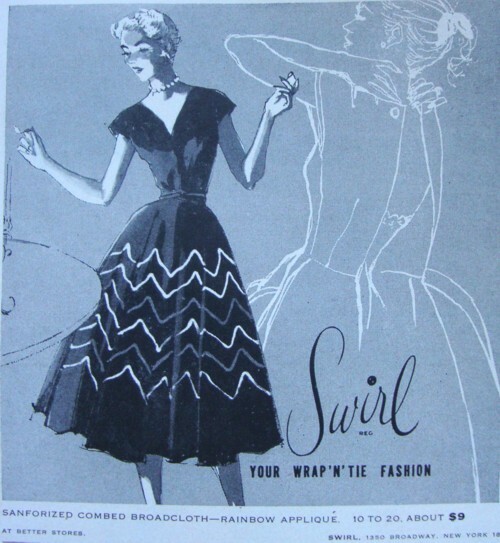 According to the 1951 ad below, the Swirl pictured came in three patterns and cost about $9. Vivian Vance’s character on the TV classic, I Love Lucy, Ethel Mertz, frequently wore this style Swirl in the early days of the program. By 1953, Jack Nachman, president of the company, was looking to relocate the Swirl operation to the South. First, they would to be closer to where the cotton fabrics they were using were being produced. This would save transportation costs. Secondly, it’s very likely that they wanted a cheaper source of labor, which was easily found in the non-unionized South. So Mr. Nachman went south, to Greenville, South Carolina. Through business contacts there he settled on the little town of Easley, about fifteen miles from Greenville. The location was ideal. The town was in the middle of the cotton belt – the area where cotton was grown and then made into cloth. The textile industry was booming. In fact, there were sixty-seven factories producing cotton fabric in the Greenville area, factories eager to supply their product to a new clothing production plant. Photo courtesy of Cur.io Vintage, dress is now in my collection. I’m not really sure when the last Swirl wrap dress was made, but I’ve seen them that were knee length and had care labels, so it is my guess that the wrap Swirl was still being made in the early 1970s. They also started making them floor length, as the fashion for floor lenght dresses re-emerged in the 1960s. By the end of the 1980s, the main product at Swirl was the Models Coat. In 1990, the first real signs of trouble for the company came when sewers were laid off and production curtailed. The decline of the company occurred slowly through the 1990s, and in 1998, Swirl announced that it would be closing its main facility. The remaining jobs were phased out, and the company closed the Easley factory for good in 1999. Next: Some hints on dating Swirl dresses. How could there be a simpler way to get dressed? 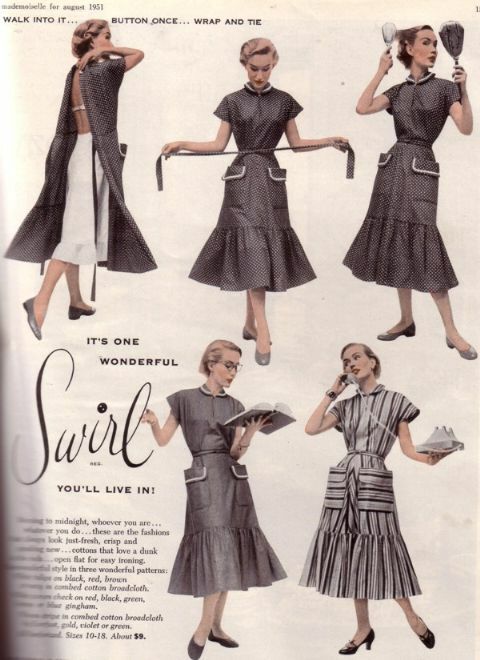 Even in the 1950s, women looked for ways to simplify their busy lives, and the Swirl wrap dress people used that as the premise behind their advertising. Today, the Swirl has a bit of a following, and I’ve seen prices steadily rise over the past ten years. If you’ll look carefully at the ad, you can see that the price was $9. That sound pretty cheap until you put it to an inflation calculator, and realize that in today’s dollar that would be $72. $72 for what was basically a glorified housedress? Yes. People expected to pay more for clothing in the 1950s, and they expected it to be well made and expected it to last. And that is why the Swirl dress is relatively common today. It was made from quality fabric by women who knew how to sew a dress so that it would last. Several years ago I researched the company that made the Swirl dress, L. Nachman and Son Company, after I realized that the dresses were made in a small South Carolina town an hour away from me. Using old newspaper accounts and oral histories, I was able to piece together the story behind the dress. 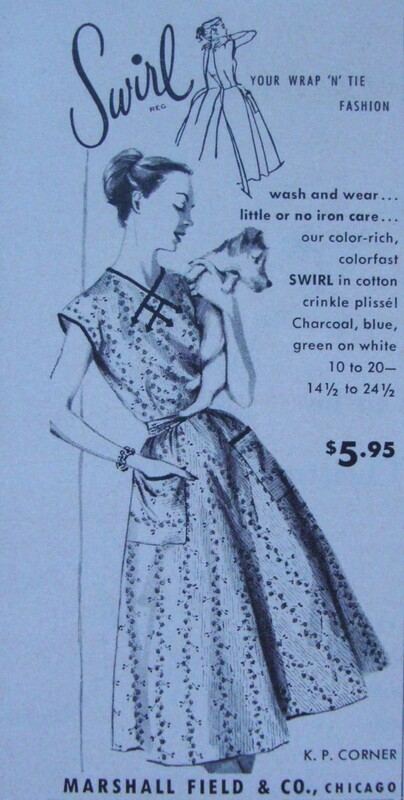 Below these 1952 ads I’ve added an update on how to date your Swirl dress. 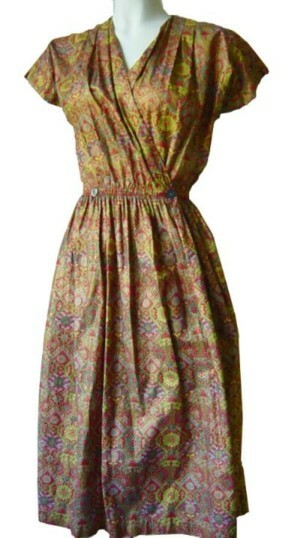 Usually when you see a Swirl dress advertised, it is described as being from the 1950s. 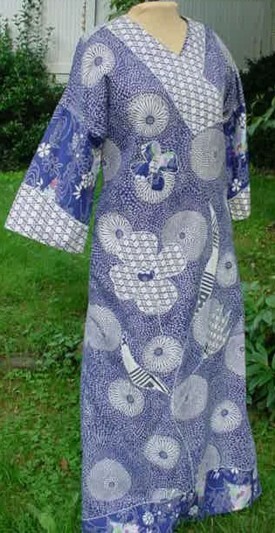 However, the Swirl wrap dress was made starting in 1944, and its manufacture continued at least through the 1960s and possibly even into the 1970s. So how does one date a style that was made practically unchanged for 30 years? 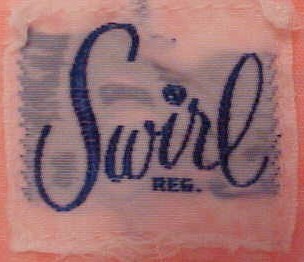 The problem with the common Swirl label is that it was used for some time, and even though most people associate that label with the 1950s, it was also used on early and mid 1960s wrap dresses. To further complicate matters, the Ty-Wrap label is sometimes found on 1960s wrap dresses. Perhaps a cache of the old labels was found and put to use at that time. To see photos of the labels, look at the Swirl page at the Vintage Fashion Guild’s Label Resource. Probably one of the best ways to judge the age of a Swirl is by its length. The later Swirls are considerably shorter in keeping with the shorter dress styles of the mid 1960s. If you have a Swirl that you think is older, but it is short, examine the hem to see if it was professionally sewn, as it is quite possible it was shortened in the 1960s. 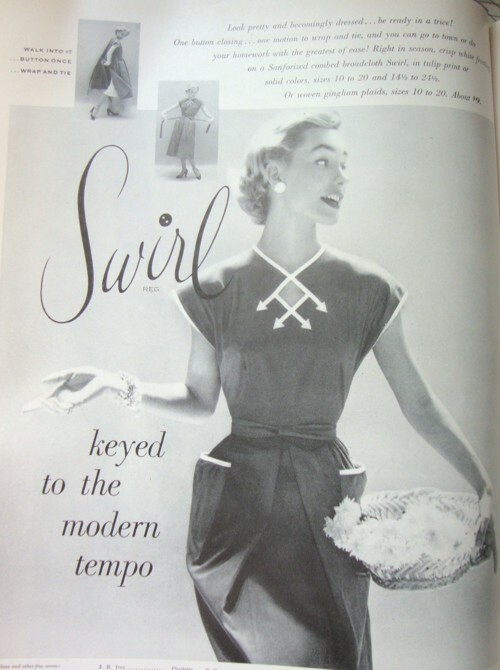 Also, later Swirls are often not as full through the waist as those of the mid 1950s. Another thing to consider are pockets. Some 1940s Swirl dresses have pockets that are sewn into the side seams. 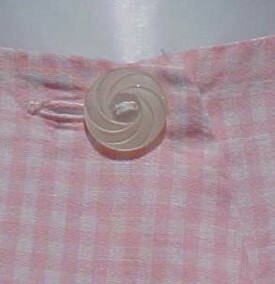 The early 1950s Swirls had huge patch pockets. Later Swirls often had smaller pockets, one smaller patch pocket, or even no pockets at all. Another clue might be the type of print and the colors used. Pink and yellow seem to be popular colors for Swirls, regardless of age, but pay attention to the details. The ultra feminine fabrics of the 1950s, like the ballerina print in the top ad, gave way to darker colors and more somber prints in the early 1960s. NOTE: I originally posted this in the fall of 2007, but decided to repost it because so many of you admired the print. So here are some close-up photos, and a little more about Swirl. I’ve been a fan of the Swirl dress for a very long time – ever since I discovered that they were made in a little South Carolina town about an hour’s drive from me. But I don’t collect them. For several years I’ve been looking for the ONE PERFECT SWIRL to add to my collection, not an easy task considering that my collection is very much travel and sportswear oriented, not exactly a grouping where a lowly housedress would feel comfortable! But when my friend Carrie of Glad Rags and Curios at Ruby Lane posted pictures of this one at VFG, I knew my search was over. Could there be a better dress for a late 1950s road trip? I don’t think so! Part of the reason I particularily wanted a Swirl was because of what it represents in terms of the textile industry in the Carolinas. When I first started looking for information about the company, most of the Googling I did only produced references to the factory and to the factory outlet store in obituaries. Back when the textile and garment industry of this region was good and healthy, most of these small plants had factory outlets where people could get some incredible bargains. Starting in the mid 1960s my mother and a group of her friends would, several times a year, make their rounds of the outlets. And while they never visited the Swirl outlet, they did go to others in the Upstate of South Carolina and the North Carolina Piedmont. Much of the clothing I wore as a child was not only made in the USA, but it was made within 100 miles of where I lived. Interesting how one of the things that people are now trying to do to lessen their negative impact upon the Earth is to buy locally made products. My mother was an environmentalist and she didn’t even know it! Today, the only textile product that I could buy from a Carolina factory outlet is socks! great post. this dress is adorable. I am so happy to learn more about SWIRL. I have several in my collection. They have never been washed so the starched size tag which includes the style number,size is next to the Swirl tag. I also have Neat & tidy. Stripes, seersucker prints, and cotton prints. All big pockets. I did not know about the Swirl button so I went and checked and yep they have it! :) I looked for a hang tag but alas none. Thank you so much for the re-post and all these lovely close up photos. 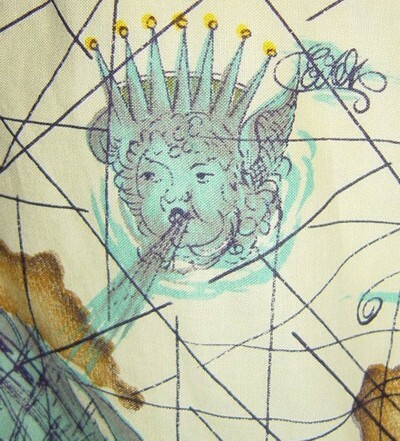 The face of the wind with the crown is priceless. This is indeed the Swirl to beat all Swirls. And I love that your mother was an environmentalist and didn’t know it! Deb it sounds like you have a great vintage collection! What Is a Swirl Dress Worth? I visit several online forums that discuss historic and vintage clothing. On one of them recently, there has been quite a bit of talk about value. Since this forum is frequented by both buyers and sellers of vintage, one can get a pretty good view of both sides of the current pricing of vintage clothing. As you might expect, sellers tend to think vintage clothing is an excellent value, but buyers tend to think that prices are too high. One garment in particular that is a part of this debate is the Swirl wrap dress. When I did my research and wrote my history of the Swirl company in 2005, I thought that the Swirls that came up for sale on eBay were terribly undervalued. Most of them were selling under $15. I say “on eBay” because at that time, Ebay was the major shopping site for vintage. Today that is not necessarily the case, with all the new sites and private websites that have sprung up in the past 5 years. A quick look at one of these newer sites, etsy, brought up several Swirl dresses, with the least expensive being $60, and it has some stains. So why are Swirl dress prices so far above the inflation rate? It all has to do with demand. Back in the early 1980s I was collecting antique and vintage Christmas ornaments. They were relatively inexpensive, and I was getting a very nice collection. One day in 1984 a dealer commented that I’d better buy now because a Christmas price guide was in the works. And he was right. Within a year there were 6 books on collecting Christmas published, and prices went through the roof. People found the books, liked what they saw, and demand for Old Santas and ornaments skyrocketed, along with prices. But it is not the price guides that have inflated the price of the Swirl dress; it is internet buzz. There is a whole thread on Fedora Lounge that discusses the dress, there is a flickr group for it and several of the vintage lifestyle bloggers regularly show off their Swirls. Is it any wonder that demand has increased? Just out of curiosity, I went to several of the online historic price inflation calculators to see what a Swirl bought in 1952 for $9 would be in today’s inflated dollar. Surprisingly, the answer is about $72. They were not cheap, but people did not have closets bulging with cheap imported clothing. Clothing dollars were spent more wisely because people did not have as many to work with. And Swirls were a wise buy, as evidenced by how many of them have survived from the 50s and 60s, many looking like new. So true on all points! this is a great entry! Thanks so much! I *love* the map/ships one you’ve pictured. I still have my solitary ‘carpet-print’ one. But guess what, I’ve recently stumbled across some matching pants – how confusing is that?? Well, you are indeed a psychic! I have found another ‘Swirl’–the cutest ever! So yes, I was looking into the current value and noticed the skyrocketing prices for these dresses. here’s some pix of that dress on flickr: http://www.flickr.com/photos/39426423@N02/4752328750/PS, I am continually amazed by the price quotes on “Couture Allure” that compares the original sale price with the current dollar value. No question, that’s why everyone’s mom had to sew. Swirls are not only comfortable & flattering to a woman’s curves they tend to have been done in the most interesting prints. 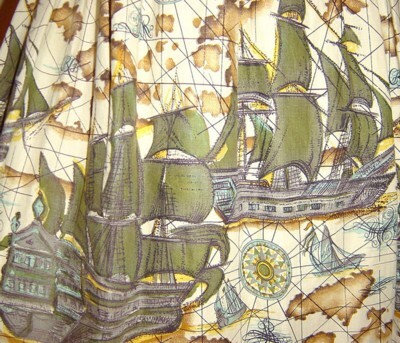 I love that nautical print madly. Deliriously. Sigh.Alas, I don’t have a single swirl dress, though it is not for lack of trying! Thank you for posting this, Ms. Lizzie! I know what you mean. The problem with selling and buying on ebay is that there is an over abundance. Not just in garments but; in sellers that are not real sure of what they actually do and do not have. I have gotten countless garments that seemed authentic enough to have it arrive and the label was something else completely. From the 2000s advertised as 1950s! I think the reason garments sell so inexpensively on ebay is because many buyers are afraid the seller doesnt know what they are talking about. I much prefer to pay more from a dealer that knows thier product. Also, remember these high prices we are currently seeing can fall at anytime and like most everything else in fashion could just be a fad? I hope not I just love vintage fashion! Thanks, everyone. I knew this would strike a chord with some of you.Jen, that IS a really great Swirl! Lin, I must see those pants… and soon! Michelle, I agree; it is best to do any serious buying from an experienced vintage seller. And I really should do a post on past vintage fads.